This charming hanging sculpture formed in the likeness of a gracious bat. 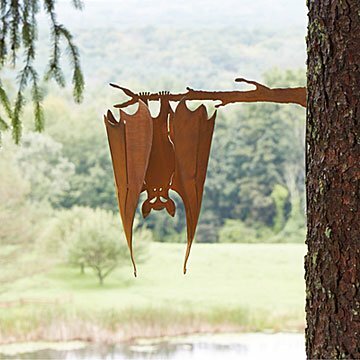 Keep creativity on your radar and in view with this charming hanging sculpture formed in the likeness of a gracious bat. Handcrafted in Tucson by artist Chris Crooks, this eye-catching design is perfect for greeting Halloween trick-or-treaters or scaring up the conversation year round. Age-accelerated steel gives the bat a bright ruddy rust patina, offering a rustic finishing touch for your outdoor décor. Handmade in Tucson, Arizona. No special care needed however, patina will darken over time. If attaching to finished wood work, or masonry that is exposed to the weather, the piece should be sprayed with exterior sealer to avoid rust stains. Looks good in person and a great decor item. Easy to mount. It would be better if the metal was either a bit thicker or harder as the metal is easily bent. Well made, sturdy fun piece. Nailed it to a tree. looks good. Since not all copper (? ), sprayed it with Rust-Oleum Clear Enamel to prevent rust (hope that works)! Just love this backyard decoration! Perfect for backyard decoration. It is just adorable. We receive lots of comments from visitors. I saw the bats in a gift shop in Arizona but since we were flying home I didn't want to worry about damage and packing it. I waited until I got home and found it on Uncommon Goods website. Thanks! I love to find unique items. Uncommon Goods always delivers! I have mine hanging in my kitchen - LOVE IT! It's very sturdy & well-made. Caveat: The screws to hang it are silver in color. After hanging, I dabbed them with a bronze colored marker. Perfect! It is bigger than I expected and made from heavy-duty metal that should last for a long time. My husband and I just bought a house and acreage in Alabama. We hope to attract bats to the property to help with insects, so this was the perfect addition to our home.